BBC Two - Horizon, 2018, The Placebo Experiment: Can My Brain Cure My Body? 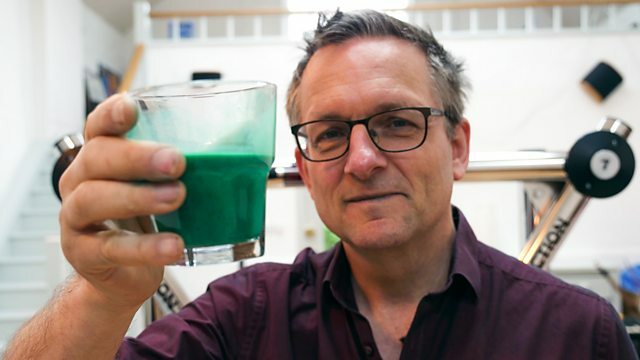 Dr Michael Mosley attempts to cure real pain with fake pills in Britain's largest ever trial to investigate the placebo effect. He also tries to experience it for himself. Could the power of fake pills be used to treat some of our most common medical complaints? To find out, Dr Michael Mosley embarks on Britain's largest ever trial to investigate the placebo effect. He is heading to Blackpool to gather 117 people suffering from backache - one of the leading types of chronic pain - before trying to treat them with nothing but fake pills and the power of the mind. Working with experts from the University of Oxford, Michael discovers that the placebo effect is more than just a medical curiosity. The brain is actually capable of producing its own drugs, and these can be more powerful than prescription painkillers. Michael's volunteers come from all walks of life, but they have all suffered with bad backs for years and feel their conventional medication isn't up to the job. They include Stacey, who is struggling to keep up with her two energetic daughters, wheelchair user Jim, who longs to be able to get back on a boat, and poker player Moyra, who is looking for a painkiller which doesn't affect her performance. They think they are taking part in the trial of a powerful new painkiller, but their blue and white capsules actually contain nothing but ground-up rice. Can this fake treatment make a real difference? And how will the volunteers react when Michael reveals the truth? Michael also finds out about some remarkable placebo experiments from around the world, including a woman in Oxfordshire who experienced a near-miraculous recovery after undergoing fake surgery to fix her chronic shoulder pain. Plus a team in Lancashire who want to see if the placebo effect can cure a broken heart. And Michael discovers a team in Germany working on a placebo that works even if you know you are taking it, which might improve the lives of transplant patients. Michael also tests this out on himself - attempting to train his own body to respond to a fake treatment - a foul-tasting green drink - as if he were taking actual drugs.